This month’s meeting will be on Friday, April 1, at 8:00PM in room 215 of the Aerospace Engineering Building. Riders from the Montgomery area are welcome to meet at the home of Russell Whigham, 518 Seminole Dr., and carpool over to Auburn. Plan to be ready to leave for Auburn at 7:00PM. Our star party this month will be the better of the two nights of Friday/Saturday, April 8/9, at Cliff Hill’s farm. Several of our regular volunteers for this annual event are conspicuous by their absence on this list. We still need your help. Let us know if you can try to be there. We need help at the AAS information table, someone to coordinate satellite passage announcements to the visitors, and someone to facilitate use of the AAS PST solar telescope. If you can help with the telescope clinic, we need your help too. Note that we’re beginning earlier that usual this year so that visitors can view the Sun with our new solar scopes. If you have a traditional white light solar filter, be sure to bring it as well. Drop-in’s are welcome if at the last minute you see that you can come, but you may not have a name tag or sandwich if you don’t let us know in advance. Remember to wear your AAS shirt. If this will be your first Astronomy Day with us at the planetarium, you can get an idea of what to expect from the Web pages linked at http://www.auburnastro.org/gayle.htm . Primary targets of the telescopes will be the first quarter Moon, Saturn, and eventually, low in the east, Jupiter. Do you have too many telescopes cluttering up your garage? Rick has also encouraged us to bring our surplus hardware to sell. This is a great time to make it available to a would be buyer. We will continue to give the free year’s AAS membership as a door prize. This has never resulted in an actual new membership, but we’ll continue the tradition. A few years ago Gail Smitherman suggested that we also donate books and other astronomical gifts. I recently found a book at Barnes & Nobles on the clearance table to bring. If you are so inclined, just bring your donation to the event that day, and we’ll be sure the society gets a plug from Rick. Below is the agenda shamelessly lifted from Rick’s Web page. Public Viewing of the Sun through Solar Scopes provided by the Planetarium and Auburn Astronomical Society. Members from the Auburn Astronomical Society will host a telescope clinic to answer questions about different types of telescopes. If you have a telescope that you need assistance with, you are encouraged to bring it to this event. Dr. David T. King Jr.
Dr. King's presentation will be on the Wetumpka Meteor Crater. 7:00 PM - "Tour of the Night Sky"
The Spitz STP projector in the auditorium will be set to display the stars as seen from Montgomery Alabama on April 16th, 2005. A brief tour of the night sky will be conducted to point out the constellations visible . Auburn Astronomical Society (AAS) has agreed to support this event by once again bringing out telescopes for the public to view the wonders of the night sky. Super, I really appreciate all the folks who stepped up to the plate (it's spring, I thought I could use a baseball metaphor) each year. I have been in contact with Dr. King and he is going to do a briefing on the crater again this year. He said that it was modified, so it will be a little different. Mr. Dorsey will also have time to say a few words on the status of the Wetumpka Meteor Crater Commission. I also allotted some time for Rhon to say a few words if he would like. I intend to mix the Astronomy 101 with the tour of the night sky we typically do each year. My plan is to once again work with Subway and see if we can have food and drinks for your folks and mine. Let me know if there is anything else we need to do, or that you can think of between now and then. Thanks again for all your support and help with this endeavor (threw in a shuttle name just for kicks). One of the most dramatic breakthroughs in astronomy in the past decade has been the discovery of planets around other stars. In every case, the presence of the planet is inferred by the motion they impart on their parent star; there is a periodic Doppler shift in the spectrum of the star as it moves in reflex to its planet. But now, astronomers have used the Spitzer Space Telescope to detect photons from the planet directly. There are over 160 planets that have been discovered to date. A small fraction of them have orbits oriented such that they pass periodically in front of their parent star, as seen by us. When this happens, they block a small fraction (typically 1%) of the light of the star while they pass in front. The question some clever astronomers considered is: can we see the effect when the planet is hidden by the star? Luckily, they had taken Astro 203, so they could reason as follows: from the Doppler shift data, I know the period of the orbit. Knowing the mass of the parent star (given its spectrum, the temperature can be inferred, and knowing it is a main sequence star, the mass follows), I can therefore determine the radius of the orbit from Kepler’s Third Law. Given the radius of the orbit, and the temperature of the star, I can infer the temperature of the planet. From the fraction by which the light diminishes during the planetary transit, I know the planet’s radius. So if I know the planet’s radius and its temperature, I can get its luminosity. When they went through these considerations for a particular transiting planet known as TrES-1 (that stands for ‘Trans-Atlantic Exoplanet Survey’, in case it wasn’t obvious), they concluded that the planet in this case it roughly the size of Jupiter, in a 3-day orbit at 0.04 Astronomical Units (i.e., very close to its parent star! ); it is therefore quite hot, with a predicted surface temperature of 1000 K. Such a planet has a black-body spectrum that peaks at about 3 microns, i.e., in the infrared part of the spectrum. The parent star, with a surface temperature of perhaps 4000 K, is far from its peak in the infrared, so the contrast between planet and star should be maximum at that wavelength. So they observed the planet-star system with the Spitzer Space Telescope, with its sensitivity to infrared radiation. The telescope certainly doesn’t have the resolving power to distinguish the planet from the star, but it when the planet disappears behind the star, the total light should decrease by just a smidgen. This is exactly the effect seen. David Charbonneau and colleagues took a picture of the star with the Spitzer Space Telescope every 13 seconds for six hours, centered on the predicted period of 2.5 hours when the planet should be behind the star. They saw a diminution of light exactly when expected. The effect is tiny. Even though the planet is at its peak of the blackbody spectrum, and the star is far from its peak, taking the light of the planet away decreases the total brightness at 4 microns by only 0.06%! But this was just the amount expected, given the numbers above. Pretty cool! But what does it really tell us? Well, this is the first time that photons from a planet have been unambiguously been seen directly (as opposed simply to measuring the effect of the planet on its parent star). Astronomers are eager to learn about the physical properties of these planets, starting with such basics as their mass, size, temperature, and albedo (i.e., reflectivity). These measurements confirm estimates of their size and temperature, and show that the albedo is actually quite similar to that of Jupiter. The evidence that these objects look something like Jupiter gets stronger every day. This was taken by the Cassini spacecraft orbiting Saturn; it was taken from an orientation with the rings exactly edge-on. Notice the moons Dione and Enceladus in the ring plane. 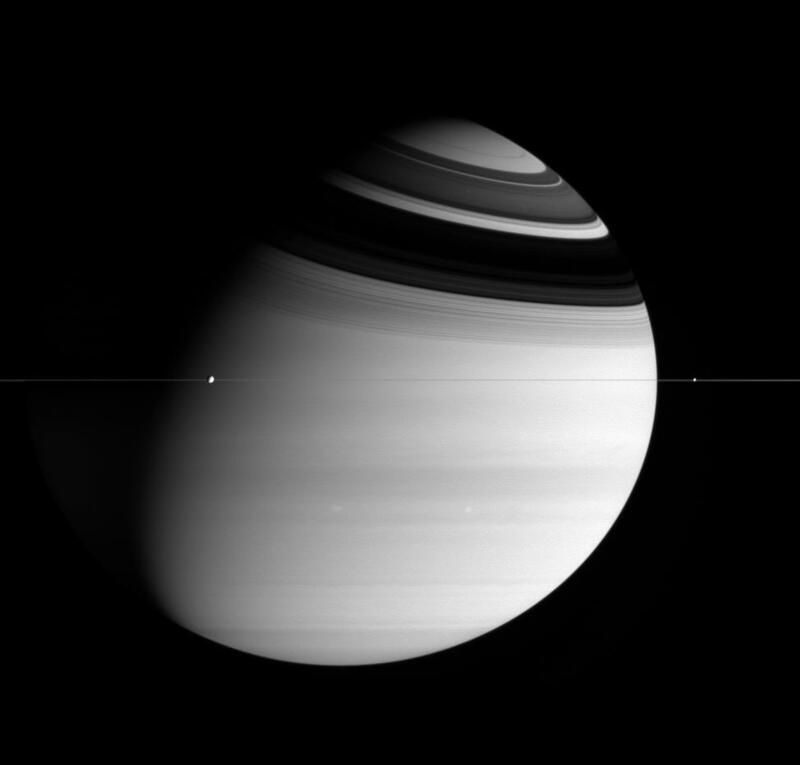 Most striking is the shadow cast by the rings on the Northern hemisphere of the planet. Breathtaking!